The String of Pearls (an-nazm/an-nizam), or the Belt of Jawza’ (nitaq/mintaqat al-Jawza’), represents the belt of pearls that wraps around the waist of the female figure of Jawza’. In the earliest times, the name referred to only the three bright stars that are lined up in the middle of the figure. The name “Jawza’ ” is a feminine derivative of the word that means “middle”. 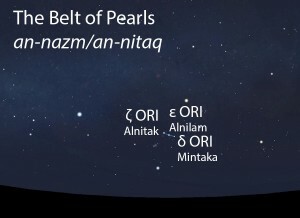 The Belt of Pearls (an-nazm/an-nitaq) as it appears in the west about 45 minutes before sunrise in early December. Sky simulations made with Stellarium. The Belt of Pearls does not figure in the calendar of the rains stars. However, as Jawza’, the same star grouping marks the start of the cold winter season called ash-shita’. The Belt of Pearls does not figure in the calendar of the lunar stations. 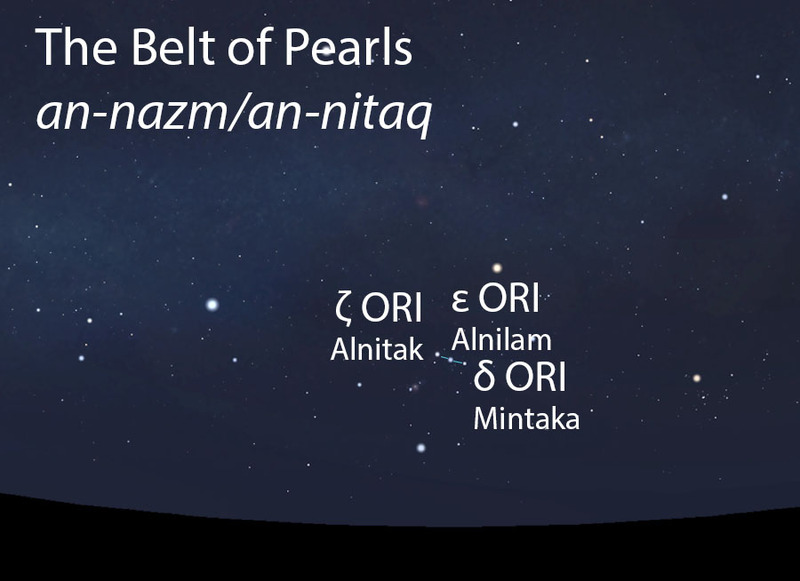 The Belt of Pearls is part of the Jawza’ (al-jawza’, الجوزاء) folkloric celestial complex, which developed over time from these central stars.